Carpe Diem Arts’ mission is to present multi-generational and multicultural community events and arts outreach activities in Montgomery County and the greater DC area, and on Maryland’s Eastern Shore, creating opportunities for people of all ages and walks of life to participate in the visual, literary and performing arts. Busy Graham knows a lot about seizing the day as the executive director of her organization, Carpe Diem Arts (CDA). 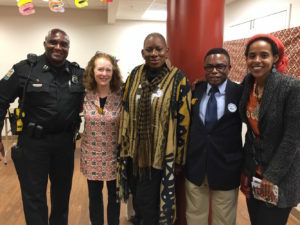 It offers diverse programs to schools and underserved communities, correctional facilities and senior centers in the Silver Spring/Takoma Park area. CDA keeps Graham inspired by both the arts and by the communities it serves. Graham wanted something more for local communities with respect to music, arts, storytelling, and dance. There are few programs for low-income community members and CDA creates these spaces for the diverse communities to experience the joy of the arts. When asked why CDA is important Graham explains, “I believe that the arts are of critical importance in terms of getting kids and seniors engaged in something uplifting and sustaining. There are so many sad things and struggles. But the arts are key. Find something you’re good at and it can be a springboard for better living in the world.” CDA provides these programs that many communities might not otherwise have access or opportunity to. Since the over two decades of growth and development of what is now Carpe Diem Arts, it seems like there has been a well of need uncovered. Carpe Diem works with the Collaboration Council and provides after-school programs in two housing communities both with a high refugee and African immigrant population. One is in Essex House and the other is a Park Montgomery in Silver Spring. The arts help the people celebrate their heritage and their roots. Engaging in the community is a critical goal for Carpe Diem. There’s a monthly community dance as well as monthly sing. There are celebrations of cultural heritage months. Located at both the Seekers Church and the Silver Spring Civic Center these celebrations of the diversity in the community through the arts are almost magical. There are so many ways to get involved in Carpe Diem Arts. Aside from monetary donations, which are always welcomed, hopefully in the future CDA will have a forever home. Stay tuned for the start of a capital campaign to raise funds for that big endeavor. They also have a goal of expanding after-school programming and collaborating with housing developments and community centers. The idea of a “living and learning community” is what CDA is all about. Join Graham and Jump Start with the Arts the first Thursday of each month at El Golfo restaurant! 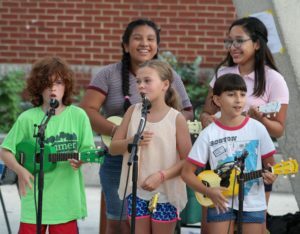 Their partnership provides further resources for the local arts community especially bringing music and arts into head start, kindergarten, and 1 st grade classrooms in Title I schools. One of the goals is making arts a more integral part of everyone’s education. So of course expanding the donor base is a huge help but there are other ways to help CDA. Carpe Diem Arts prides itself on engaging with the community and building more partnerships. Corporate sponsors are always wanted but there are so many ways to support by volunteering. There is a need for administrative tasks, documenting programs through pictures and video and helping to raise the public profile. They are currently actively seeing a volunteer coordinator and someone to help with social media. If you’d like to see how you fit into the Carpe Diem Arts family, take a look at their website for more information. Lauren Lee is a Silver Spring resident and mom to three amazing little people. She recently stepped down as President of Northwest Branch Pool where she bravely served for six years. Even as a Silver Spring native, Lauren is always impressed by the amazing people she meets doing amazing things here in our community and loves to write about it for Silver Spring Cares.